In Ezekiel 43 the Lord gives Ezekiel a vision of God's glory entering the Millennial Temple from the east, through the Eastern Gate. The Lord then says to Ezekiel: "Son of Man, this is the place of My throne and the place of the soles of my feet where I will dwell among the sons of Israel forever" (43:7). This prophecy was partially fulfilled more than 400 years ago in 1517 when the Turks conquered Jerusalem under the leadership of Suleiman the Magnificent. 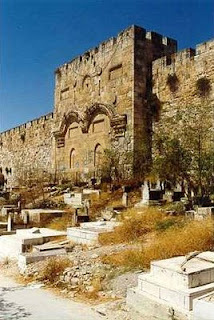 He commanded that the city's ancient walls be rebuilt, and in the midst of this rebuilding project, for some unknown reason, he ordered that the Eastern Gate be sealed up with stones. Then, we will witness a replay of the Lord's triumphant entry into Jerusalem. With angels hovering above and millions of the Redeemed filling the Kidron Valley, Jesus will ride up to the Eastern Gate on His white horse, and as He approaches the Gate, it will blow open. He will then enter the City of David, and to the triumphant shouts of "Hosanna to the Son of David," He will be crowned the Kings of kings and the Lord of lords. Psalm 24 describes this scene: "Lift up your heads, O gates, and be lifted up, O ancient doors, that the King of glory may come in! Who is the King of glory? The Lord strong and mighty, The Lord mighty in battle... The Lord of hosts, He is the King of glory."